set on Julia, Benedict tries to protect his childhood best friend from the man’s advances—only to discover that more than friendship is driving his desire to defend her. He surprises them both with the force of his feelings, but when Julia refuses him, and her father announces her betrothal, Benedict fears he’s lost her forever—until Julia approaches him with a shocking scheme that will ruin her for all respectable society and lead them into an exquisite world of forbidden pleasures. Welcome to the world of matchmaking mamas, rakes, and the ton. Julia St. Claire and her sister Sophia have the ultimate matchmaking mama – who will not rest until her daughters have suitably moved up in their social ranking. Ashlyn Macnamara has penned a great cast of characters – excluding the terrible Earl of Clivesden – really no one likes the bad guy. This was a quick read for me and I thoroughly enjoyed the plot. There were several laugh-out-loud moments and several swoon worthy quotes. I’ve always been a fan of the regency period and this book did not disappoint. 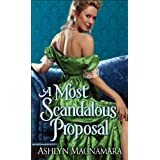 It appears that A Most Scandalous Proposal is a debut novel for the author and I definitely give it 4 stars and recommend it to others. Meet Joss – she’s had a rough life … several tragic losses leaves her less than thrilled to let people in. Enter hunky Braden a super-successful Scottish businessman with a slightly dirty mouth. His persistence and her fight then flight attitude make for a great read. The side story of Ellie and Adam added some depth to the story without taking too much from the main story. This was a well-written quick read. I started reading mid-afternoon and finished before it was time for bed. Samantha Young provided enough twists and turns to keep me on my toes but not so many that it got weird. There was several laugh out loud moments that got the husband curious what I was laughing at. That’s what Sky realizes after she meets Dean Holder. A guy with a reputation that rivals her own and an uncanny ability to invoke feelings in her she’s never had before. He terrifies her and captivates her all in the span of one encounter, and something about the way he makes her feel sparks buried memories from a past she wishes could just stay buried. Wow! What do you say to emotions that are this raw? When I am transported into the story and I can feel the emotions of the characters as if the events are happening directly to me – it’s a great book. This is what happened with Hopeless for me. I could feel Sky’s emotions and I fell in love with Holder right along with her. At one point during the book my hand flew to my mouth and I let out a small sob. My husband looked over at me, smirked, and shook his head. I rated this book 5 stars but I was completely pissed that there was just a “The End” instead of some sort of epilogue. The book wrapped up to quickly for me after the climax of the story and I didn’t get the closure that I felt I deserved after having my heart ripped out. There are parts to this story that are what I would call dark. They are especially dark considering the characters in the book are high school age. But I think Colleen Hoover’s writing style pushes you just enough toward the dark without the story becoming twisted. Overall, I would highly recommend the book. Okay so you know how they say the first step is to admit your problems? I’m going to say it….deep breath…I’m an addict. I crave my next book just like a junkie craves their next score. Fortunately for me my addiction won’t someday cause me permanent brain damage. At least I don’t think it will. There is a definite lack of sleep and my bank account takes a hit almost daily. I can’t quit and quite frankly I don’t want to. I love to read. No seriously I LOVE to read. I read 4 books between last Saturday afternoon and early Sunday morning. I’ve read 17 books since January 1st. I know I’m a bit obsessive. I laugh, I cry, I feel joy and I feel anguish. I love, I hate, I sigh and I’m transported somewhere else, I forget where I am and just somehow warp into the world the author has created for me. It’s sometimes a sickness. I seriously have to blink myself back into reality when it’s over. I can, have, and will probably read almost anything. My current addictions lie within the young-adult and contemporary genres. I’ve also been known to read Amish fiction, a few thrillers, and historical fiction. Gone With The Wind and Little Women will always be books I return to and I will always be slightly scared of clowns after reading Stephen King’s IT. I was the most prolific reader in 8th grade and I am known to devour a book in a few hours. Unless it’s terrible, and even a book lover such as myself has sadly encountered a few really sucky books over time, I usually finish the books I read very quickly. This is where the addict notion comes from. I. can’t. put. them. down. I have to know what’s going to happen. Is he cheating on her? Is she attracted to someone else? Will they break-up will they stay together… is it happily ever after? Heaven forbid if there is a next book that’s not been released yet. Book hangover doesn’t even begin to describe it.